Mt. Kanchenjunga and the neighboring peaks. Kanchenjunga Circuit Trek is a rewarding excursion in the Eastern Nepal, offering the incredible views of the Kanchenjunga summits. Mt. 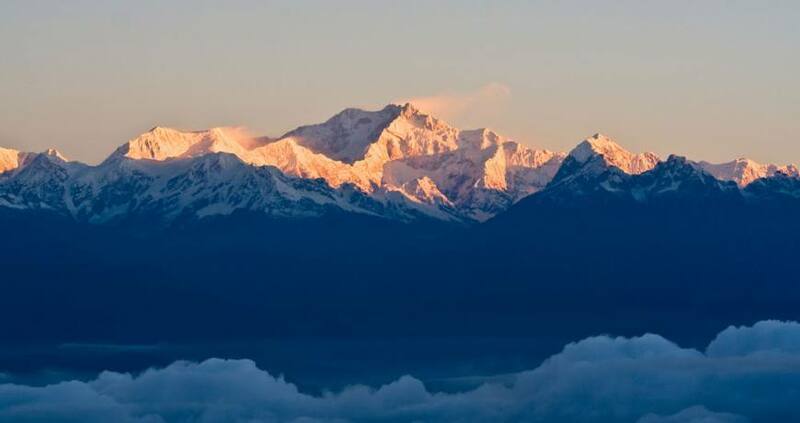 Kanchenjunga is the third tallest peak in the world, which has got 5 summits and is regarded the queen of the mountains. This adventure trekking is highly suitable for the long trip in the isolated part through off-the-beaten trail. Kanchenjunga Trekking begins from Suketar after landing on the tiny airstrip. The remote but enticing landscape begins as you head through the Kanchenjunga National Park. It is a home of various endangered flora and fauna. 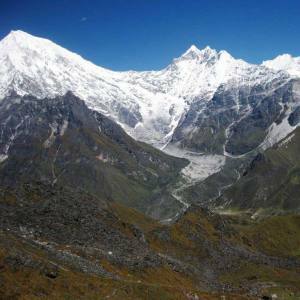 24 days Kanchenjunga circuit trek leads you to the spectacular viewpoint of Kanchenjunga base camp, also known as Pangpema that is fabulous for the breathtaking scenery of the Himalayas. During the trek, you can also explore the indigenous communities and their typical unique culture. The circuit trail of Kanchenjunga concludes in Suketar and fly to Kathmandu. For the excellent Kanchenjunga trek arrangement with experienced guides, porters and itinerary, please, feel free to contact Nepal Kameleon Holidays. Day 01: Arrival in Kathmandu (1,300m). Day 03: Fly from Kathmandu to Suketar (2,420m), trek to Lalikharka (2265m). Day 04: Trek from Lalikharka to Khesewa (2120m). Day 05: Trek from Khesewa to Mamankhe (1785m). Day 06: Trek from Mamankhe to Yamphudin (2080m). Day 07: Trek from Yamphudin to Tortong (2,995m). Day 08: Trek from Tortong to Cheram (3,870m). Day 09: Acclimatization and Rest. Day 10: Trek from Cheram to Ramche (Ramche) (4580m). Day 11: Trek from Ramche to Yalung Base Camp (4500m), back to Cheram. Day 12: Trek from Cheram to Sele La (4290m). Day 13: Trek from Sele La to Ghunsa (3595m). Day 14: Trek from Ghunsa to Kambachen (4050m). Day 15: Trek from Kambachen to Lhonak (4780m). Day 16: Trek from Lhonak to Kanchenjunga base camp, overnight at Pangpema (5143m). Day 17: Trek from Pangpema to Lhonak. Day 18: Trek from Lhonak to Ghunsa (3475m). Day 19: Trek from Ghunsa to Amjilosa (2308m). Day 20: Trek from Amjilosa to Chirwa (1270m). Day 21: Trek from Chirwa to Phurumbu (1549m). Day 22: Trek from Phurumbu to Suketar. Day 23: Fly to Kathmandu. Kanchenjunga National park entrance/restricted Permit and fees. Day 01Arrival in Kathmandu (1,300m). Day 03Fly from Kathmandu to Suketar (2,420m), trek to Lalikharka (2265m). Day 04Trek from Lalikharka to Khesewa (2120m). Day 05Trek from Khesewa to Mamankhe (1785m). Day 06Trek from Mamankhe to Yamphudin (2080m). Day 07Trek from Yamphudin to Tortong (2,995m). Day 08Trek from Tortong to Cheram (3,870m). Day 10Trek from Cheram to Ramche (Ramche) (4580m). Day 11Trek from Ramche to Yalung Base Camp (4500m), back to Cheram. Day 12Trek from Cheram to Sele La (4290m). Day 13Trek from Sele La to Ghunsa (3595m). Day 14Trek from Ghunsa to Kambachen (4050m). Day 15Trek from Kambachen to Lhonak (4780m). Day 16Trek from Lhonak to Kanchenjunga base camp, overnight at Pangpema (5143m). Day 17Trek from Pangpema to Lhonak. Day 18Trek from Lhonak to Ghunsa (3475m). Day 19Trek from Ghunsa to Amjilosa (2308m). Day 20Trek from Amjilosa to Chirwa (1270m). Day 21Trek from Chirwa to Phurumbu (1549m). Day 22Trek from Phurumbu to Suketar.